Sandos Playacar Beach Resort is an all-inclusive hotel complex in Playa del Carmen. Offering both family and adult sections, it is an excellent choice for families and couples who want the quality and convenience of an all-inclusive resort, perfectly positioned for day trips to Mayan ruins, eco-parks, jungle adventures, golf and more. Plenty of entertainment can be found at Sandos Playacar, with nine swimming pools, numerous restaurants, unlimited food and beverages, great water sports and a spectacular stretch of beautiful Mexican beach! 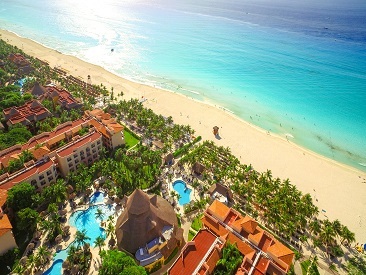 Guests seeking an active, fun paradise for the perfect vacation destination should look no further than Sandos Playacar. 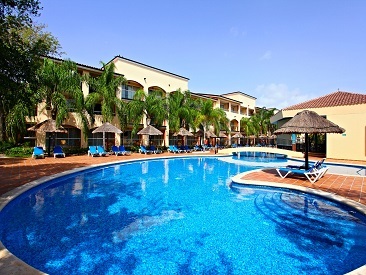 Sandos Playacar Beach Resort is an expansive, all-Inclusive hotel complex offering both family and adult sections. It is ideally situated on a magnificent white sandy beach in the gated community of Playacar, within walking distance to downtown Playa del Carmen and its famous Fifth Avenue. Sandos Playacar Beach Resort is located approximately 45 minutes from the Cancun International Airport, and the pier serving ferries to Cozumel is just a short distance from the property. The Sandos Playacar Beach Resort is an excellent choice for families and couples who want the quality and convenience of an all-inclusive resort and to be perfectly positioned for day trips to Mayan ruins, eco-parks, jungle adventures, golf and more. If you just want to relax and unwind you will find plenty of entertainment at Sandos Playacar Beach Resort, with nine swimming pools, including one exclusively for Select Club Adults Only Section and five for children, numerous restaurants, unlimited food and beverage, great water sports and a spectacular stretch of beautiful Mexican beaches! The new family area has an oceanfront main pool and swim-up bar with water park for kids. Playacar is a private, master-planned community situated on the southern edge of Playa del Carmen. Guests at Sandos Playacar Beach Resort enjoy this exclusive community's impressive infrastructure, including an 18-hole golf course designed by Robert Von Hagge, pristine biking paths and Mayan ruins accessible to the public for hiking. 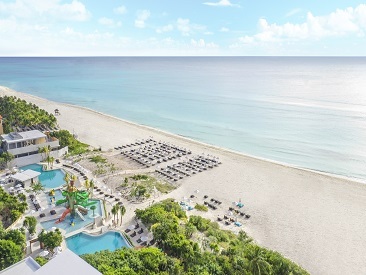 Sandos Playacar recently added an oceanfront pool and a swim-up bar with a waterpark for kids! Find something for everyone in the family with these exciting additions. Sandos Playacar is happy to offer transportation from the family area to the beach area to make relaxing even easier. Get to the beach even faster than before and soak up that Vitamin D.
The Sandos Symbolic Wedding Package is complimentary if 5 rooms for 7 nights (any category) are reserved. Couples receive fruit basket and a bottle of sparkling wine in room plus a free room upgrade (subject to availability). Add the Complimentary Honeymoon Gift to your shopping cart when making your reservation. Proof of recent marriage may be required at check-in to receive the Honeymoon bonus. Guests of Sandos Playacar Beach Resort are able to use the facilities at Sandos Caracol Eco Resort with a complimentary day pass! Limited number of passes are available. Guests must reserve a pass at the hotel they are staying in. Access is allowed from 11 a.m. to 11 p.m.. A la carte restaurants excluded. Ground transportation incurs additional fees and is not included.